In 2018, a Martian rover will land on that planet’s surface to dig in the dirt for signs of past life—and some newly commissioned Martian roadmaps may have accidentally revealed more than intended about just where that site will be. 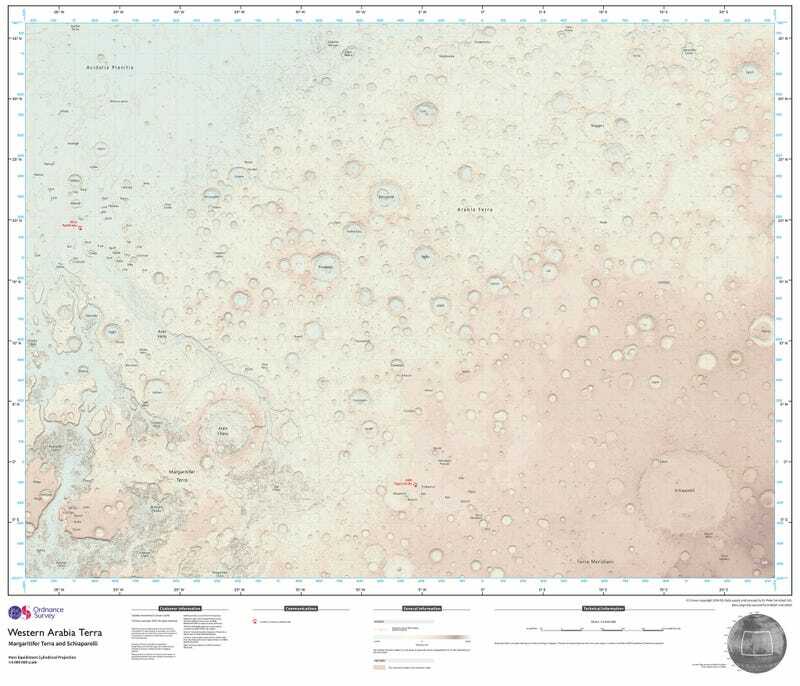 These maps from the UK’s Ordnance Survey of the Martian plains were designed to take the style of our own Earth maps and translate it to some alien, Martian territory. They’re cute, certainly, but perhaps quite a bit more than that. Now look at this map. It’s from the European Space Agency detailing the four proposed sites for the landing of their 2018 ExoMars rover—and they cover almost the exact same areas. That’s more than just an interesting coincidence. The researcher that suggested the map to the OS in the first place is Peter Grindrod, a professor who is on the ESA’s committee to choose a rover landing site. ESA’s proposed sites for ExoMars landing 2018. It’s not merely the overlap in areas that they cover that makes these maps so suggestive, though — it’s also what they are. The Ordnance Survey is not a space-focused agency. They are the organization responsible for mapping out Britain’s transit ways. In essence, these are transplanetary roadmaps, and it’s no great stretch to imagine that their intended use is to direct a traveller. Grindrod said as much to the BBC, when suggesting it could one day be used by future Mars colonists. But it makes sense that the intended traveller may be a less human, and much earlier, one: the ESA’s ExoMars rover. And, if it is indeed for the rover, then this map also says something new about where that rover may land. So, Where’s the Landing Site? There were four potential landing sites identified for ESA’s ExoMars rover when it hits the Martian surface in 2018: Mawrth Vallis, Oxia Planum, Aram Dorsum, and Hypanis Vallis. All of them are thought to be places that once held plenty of water, before drying up. When it gets to Mars, ExoMars intends to not just stay on the surface—it’s going to drill to see what lies beneath, and scientists are hoping what it finds there could be the key to knowing whether Mars once had life. The stakes are pretty high, and the debate over which of the sites to hit has been intense. OS drew a fairly large section of Martian terrain in their map, but only part of that terrain, the area around the landing sites, was selected to be in the smaller breakout section that they posted separately. A closer look at the section reveals even more. Hypanis Vallis can be disregarded as an option—it’s literally off the map. What about the remaining three? Well, all are within the parameters of the map’s breakout section, but the centering of the map is also interesting. Aram Dorsum is the furthest south of all the sites and it would make sense for a map of that particular site to pan further downwards to get a better view of lower terrains. This map, however, has plenty of northern space, well above the two other remaining sites, making one of them the most probable focus. In other words, if you were a Martian driver, this would be an excellent map for a road trip starting from either Mawrth Vallis or Oxia Planum. The case for Oxia Planum in particular gets even stronger when you look at the recommendation notes from the ExoMars landing comittee meeting back in October, when they said that they were moving towards the site as their primary recommendation. Based on this map, it appears their preference for that site is only getting stronger. We won’t know for sure just which of the finalist landing sites will be the ExoMars’ lucky host until later this year, when the ESA makes their final determination. But Oxia Planum is sounding like an even better bet today than it was before.